Hey, stuff happens even in paradise (luckily nothing serious). Here’s a traffic jam at the Hope Town harbor entrance. 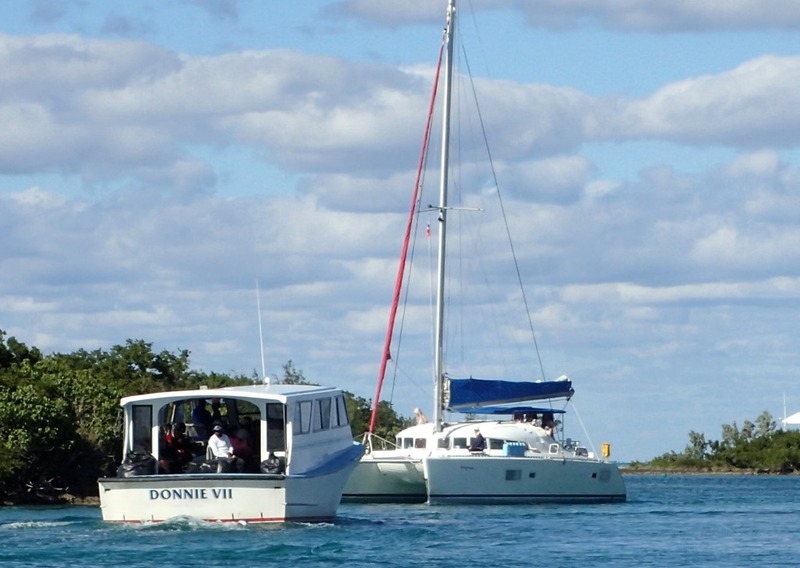 The Donnie ferry and a catamaran. The ferry stopped and let the cat go by. The ferry should have the right of way, but it’s hard to trust a charter boat – it’s not like they give a test before they let you rent the boat – you just need a credit card. Too many bad stories to tell here. Running aground in the harbor is becoming commonplace. Even shallow draft catamarans have gotten stuck. One cut the entrance buoys too tight – we took our dinghy out to help push it off the bottom. Another boat, on its way to the fuel dock, ran aground just behind our mooring, motored off, and then hit the fuel dock so hard, it took a while to untangle their boat. They are regulars in the harbor and the guy who runs the fuel dock thinks they’re dangerous. 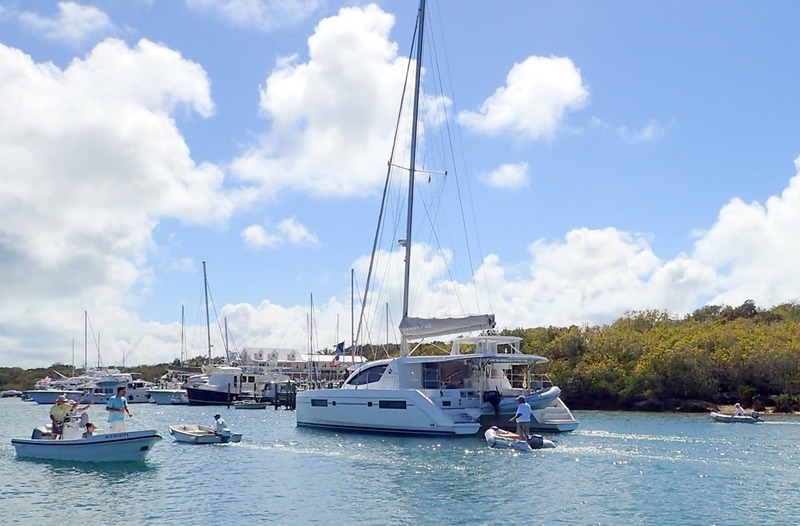 This catamaran went on the VHF to warn us that it was coming in with only one engine – makes the catamaran hard to steer – it wants to go in a circle. 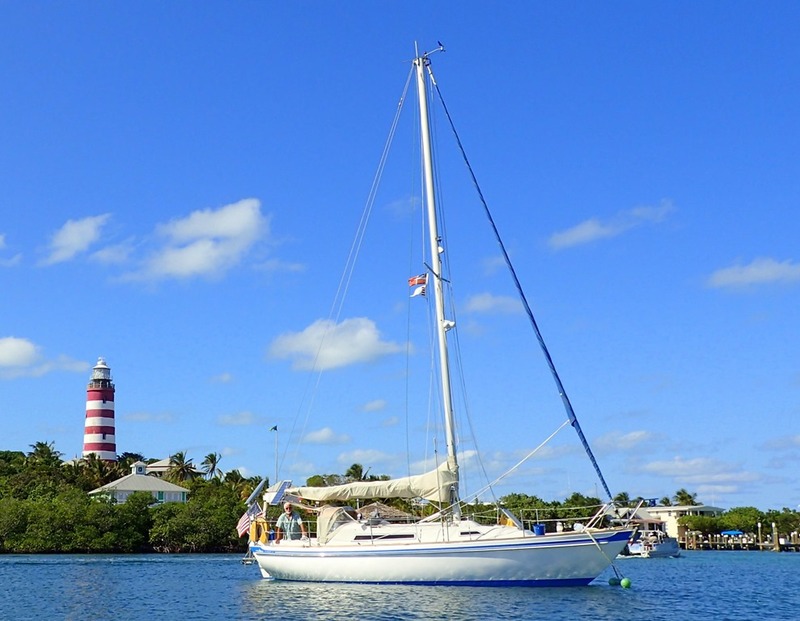 So a flotilla of dinghies guided it to a mooring, Goldwin included. Here’s a dinghy that didn’t put out a stern anchor at the dinghy dock. You’re supposed to tie the front end to the dock and put out a little anchor from the back end – keeps this from happening. A combination of wind and current pinned the dinghy underneath the dock – the tide was rising, so it might have been hard to get it out. Once they had to take boards off the dock to remove a dinghy – it had a pole sticking up through a gap in the dock. 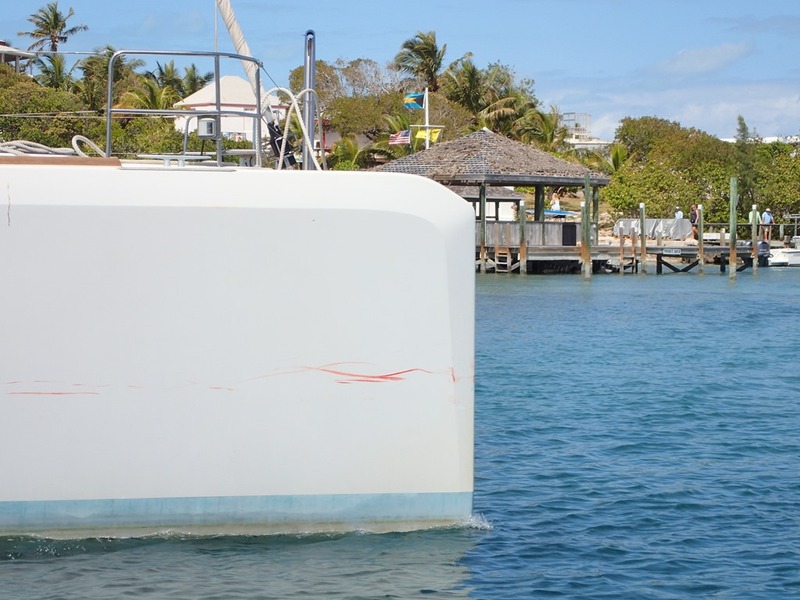 A 52’ charter catamaran got loose from a mooring last week and banged into the Abaco Rage, innocently resting on her mooring. 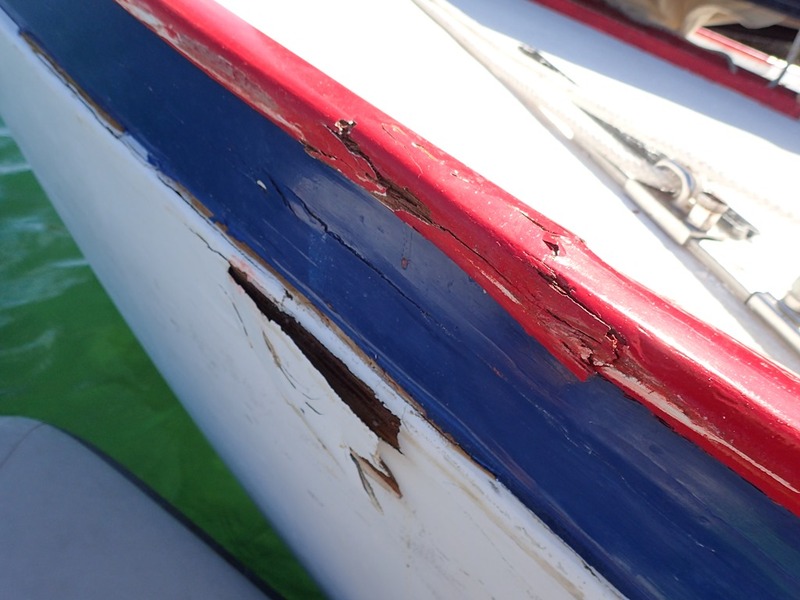 Some damage to Rage, bright red stripes of paint on the side of the catamaran. 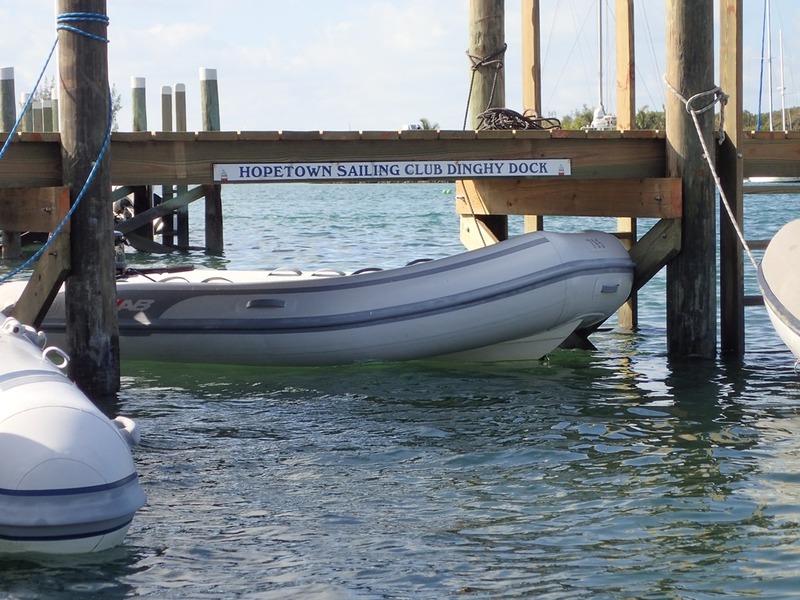 There are many docks around the harbor that allow dinghies to tie – restaurants, the grocery store, and others. 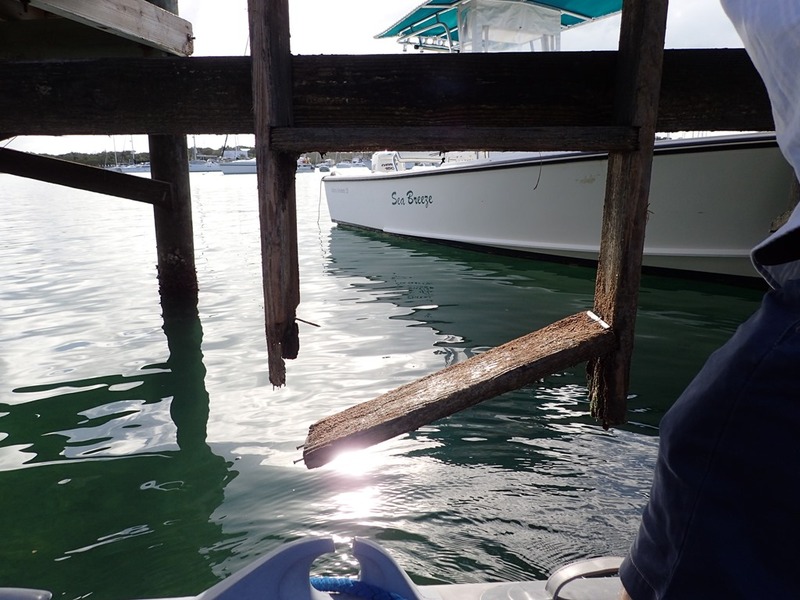 But some of the ladders on the dinghy docks are not maintained well and they rot. (Except the brand new super-duper Sailing Club dock ladders). You put your foot on the tread and – uh, oh – you could end up in the water. And yesterday, Goldwin was leaning over the side of the boat when his nice new sunglasses fell off. He watched them twirl down through the water and in he dove, snagging them on his way back up. Yeah!!! Luckily, we were just on our way to go swimming – he was even wearing his bathing suit! Despite these “dangers,” we are doing just fine on our little boat. Good thing you guys are expert sailors! And so glad Goldwin retrieved his glasses!